HEAVY META IS TORONTO'S FIRE-BREATHING DRAGON AND CIRCUS SHOW. Heavy Meta is a 30’ long, 19’ tall metallic dragon vehicle with interactive fire, sound, kinetic, and light components. Built atop a GM bus, the project is entirely designed and fabricated in Toronto. Its skin is clad in hand-cut, hand-welded sheet metal, and its wings and mouth articulate and shoot fire. Destined for Burning Man, and located in Toronto when not on tour around North America, Heavy Meta is Canada's largest art car. It has appeared at music festivals, Maker Faires, and regional burns in New York, Ontario, Quebec, Michigan, Pennsylvania and Ohio. Join us. Heavy Meta is a volunteer-run, donation-funded, art project based in Toronto, Canada. We use all donations for the immense costs of the project, from storage space, to tools, to structural steel and lumber. We sincerely appreciate every donation we receive! Marie Poliak takes Daily Planet on a behind-the-scenes tour of the Heavy Meta dragon art car, Canada's largest mutant vehicle. 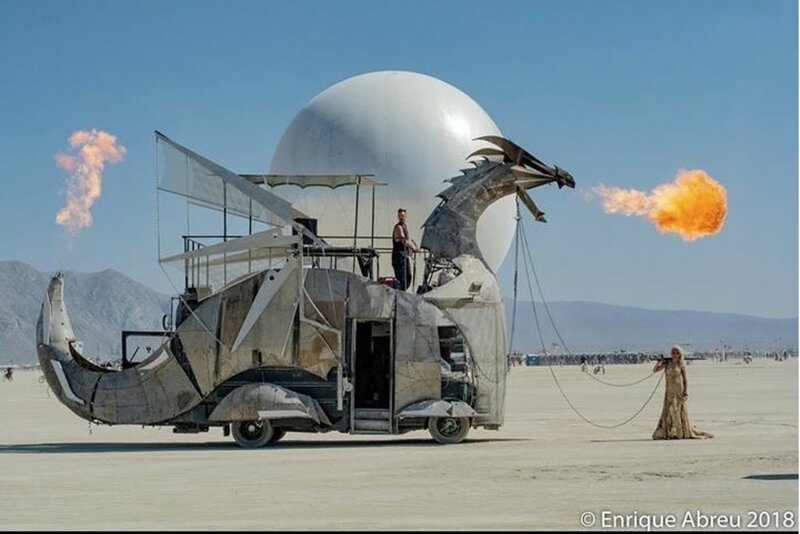 Fire-Breathing Dragon Bus. We talked to the creators behind the metallic mutant vehicle. Interview by Max Mertens.